Robert the Bruce (1274-1329), like so many figures in Scottish history, has developed a popular and colourful biography that freely weaves truth and legend. The 'Warrior King of Scotland' was, prior to Mel Gibson's portrayal of William Wallace in Braveheart, probably the historical character held dearest to the nation's heart. However, where Wallace who is included in the same list was driven by anti-English sentiment and a fiercely patriotic pursuit of vengeance, Robert the Bruce switched allegiance when necessary to further his goals. Unlike Wallace, he was successful in achieving his aims. 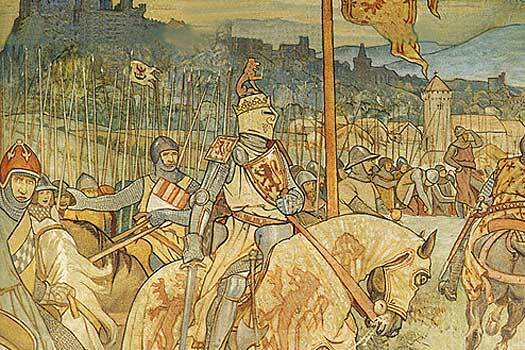 The Battle of Bannockburn was Robert the Bruce's finest hour, aided in the fight by the redoubtable 'Black Douglas'. 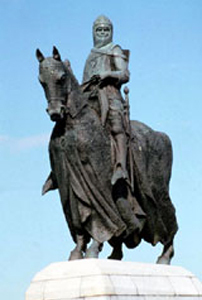 Born and raised in Ayrshire in 1274 to an Anglo-Norman family which provided the De Brus of his name, Robert Bruce was a prominent figure from an early age, with family estates both in Scotland and England and inheriting the title of the earl of Carrick at the age of twenty-one. His grandfather, Robert Bruce of Annandale, was once a claimant to the throne of Scotland. Early political life for Robert the Bruce saw him lend support for Balliol, the ruler of Scotland approved and appointed by Edward I of England. 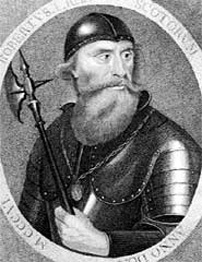 Edward, the 'hammer of the Scots', sought to annexe Scotland throughout his reign and regarded Robert the Bruce as a traitor. Eventually Edward's demands for Scottish subservience went too far even for Balliol and the resulting conflict saw Balliol surrender the throne and the Coronation Stone of Scone to the English king. In 1306 Robert the Bruce called a meeting with his rival, John 'Red' Comyn, another contender for the Scottish throne and nephew of Balliol, in Greyfriars Kirk, Dumfries. The meeting culminated in Bruce fatally stabbing Comyn in front of the church altar. To commit murder on sacred ground damaged Bruce's reputation with the Church and hence with the country, but somehow he turned it to his benefit and spun it as a necessary step in his journey to be king. He saw his opportunity, took advantage of the fiery national mood brought about by the exploits, execution and martyrdom of William Wallace, and crowned himself king of Scotland. King Edward retaliated to this outrage by sending troops north to defeat Bruce's supporters at Methven and the warrior king was famously forced into hiding in Argyllshire and the inner Hebrides. Hiding in a cave for three months, Bruce was at the lowest point of his life. He thought about leaving the country and never coming back. Legend has it that while waiting in the cave, he watched a spider building a web. The spider fell down time after time, but finally it succeeded with its web. So Bruce decided also to retry his fight. He was believed to have said: 'If at first you don't succeed - try, try again!' His words are with us to this day. The English king then sought to scare the Scots into submission by making an example of their exiled leader by imprisoning his wife and child and killing his brothers and collaborators. This tactic backfired and instead it stirred their nationalist spirit and turned the exiled Bruce into a hero. He came out of hiding and his supporters, led by Sir James 'Black' Douglas, retook the English strongholds of Dumbarton, Perth, Roxburgh, and Edinburgh Castle. Stirling Castle remained the only English stronghold and this fact prompted the Battle of Bannockburn nearby, in 1314. The victory achieved freedom and independence for Scotland, documented in the 1328 signing of the Edinburgh-Northampton treaty. Shortly afterwards the treaty with the Pope which was known as the 'Declaration of Arbroath' saw Bruce attempt to get his excommunication from the Church lifted. Robert the Bruce died of a type of leprosy soon afterwards at the age of fifty-five. His body is in Dunfermline, while his heart was taken onto the battlefields of the Spanish Crusades by Black Douglas and then returned to Melrose Abbey.